"Hs2 is committed to opening up supply chain opportunities to support and develop local and SME suppliers to deliver long-term social, economic and environmental benefits." As HS2 is an official partner of CompeteFor, all HS2 related opportunities posted on CompeteFor are available free of charge to registered users across all UK regions. As part of its commitment to engaging SMEs, HS2 will use CompeteFor to promote its indirect supply chain spend via tier one organisations using the service to publish their supply chain opportunities. Providing a free service, CompeteFor enables buyers and suppliers to easily post and respond to contract opportunities from many of the UK’s major projects from across public and private sector partners such as TfL. CompeteFor was the supply chain portal used for the London 2012 Olympics and continues to be used by other large infrastructure projects, including Crossrail and Thames Tideway Tunnel. It promotes open supply chains and allows the flow-down of indirect HS2 opportunities to be visible to all registered businesses whatever their size or location. 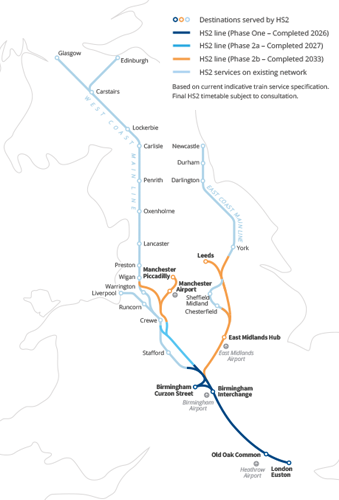 HS2 will be a high-speed railway connecting London to Birmingham from 2026, Crewe by 2027 and then Manchester and Leeds from 2033. As soon as the project breaks ground in 2017, HS2 will be a catalyst for growth across Britain, opening up local and regional markets, attracting investment and improving skills and job opportunities. Not a member of CompeteFor?